If you are looking for a relaxing, yet active holiday, our self catering holiday cottages offer a huge variety of choice. In particular there is a range of walking for everyone, from easy forest paths to challenging hill climbing. 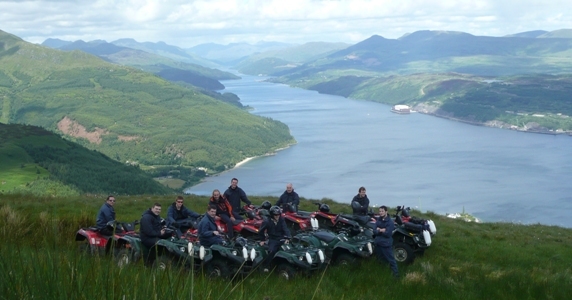 Cowal is also perfect for cycling, watersports, adventure pursuits, fishing and angling and horseriding. We are happy to provide further information on any of these pursuits, depending on what your particular interest is. On our farm, we also run a 5 star quad trekking centre which also offers clay pigeon shooting and archery. Dont worry if peace and quiet are your main reasons for a holiday because our holiday cottage guests are not aware of any of the outdoor activities - our farm covers 2,000 acres! However, if you want to take part in any of our quad treks, clay shooting or archery while staying at our cottages, we offer a 15% discount to our guests.